You can’t blame mothers for their fear of the trampoline. The combination of youth, metal springs, and aerial stunts has no doubt injured enough people to launch the equipment itself into the company of the most dreadful contraption an offspring could gravitate toward: a motorcycle. The trampoline frees us from gravity with delightful and reckless abandon. It is a thrilling and dangerous apparatus. Which is why we love it so much and can be thankful that Chris Kane only listened partially to his mother, that he kept on bouncing a board on his trampoline. Chris Kane, President and Co-Founder of Bounceboard. 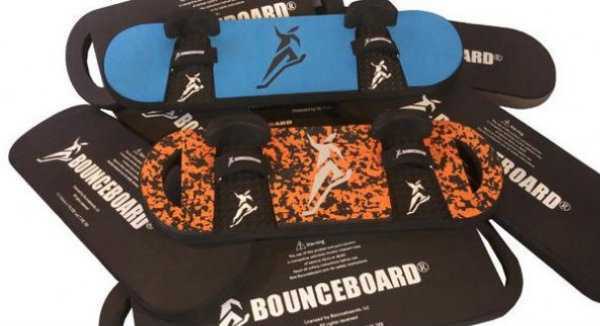 I founded Bounceboards LLC in 2010, which is a company based around our patented sporting good products called Bounceboard® trampoline boards. I designed the products based on a need to practice my aerial snowboarding tricks in the off-season. While the company was founded in 2010, the journey began long before that when I was about 12 years old – jumping on our backyard trampoline with my snowboard. I am now 27, and still operate the company that started the day my Mom forbid me to jump on our trampoline with my snowboard for fear that I would knock my teeth out. 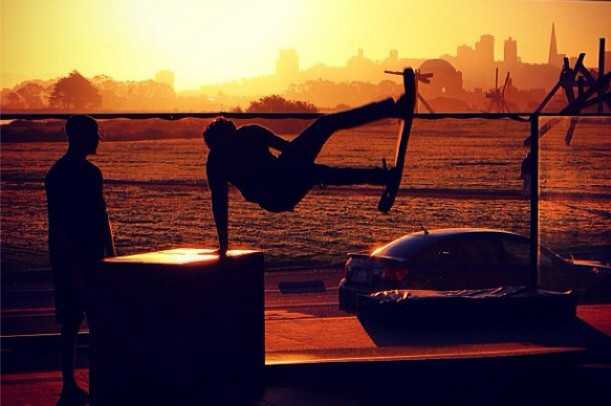 What makes Bounceboard so killer? 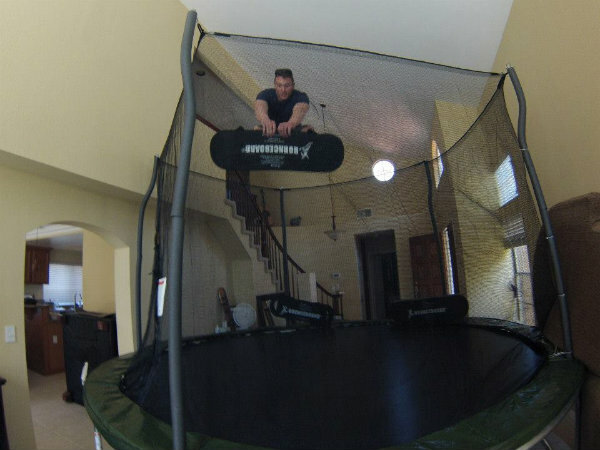 We created the original trampoline boards. Bounceboard(R) trampoline boards are the only brand that RedBull aerial awareness coaches use to train their athletes with on the trampoline. What has been the biggest startup surprise for you? I just got back from a trade show in Colorado that had a very rough start. I arrived at the convention center the evening before the show so that I could set my booth up. When I arrived at my booth, the pallet containing all my materials to set up was not there. I asked around, and the floor manager said that my pallet was sent back to storage and that I would not be able to retrieve it until the next morning. The show started at 8:00 am the next day, so I got up early and walked over to the convention center around 5:00 am to give myself plenty of time to set up. When I arrived at the convention center, the security guards would not let me on the floor even though the floor manager the night before said it would be alright. The floor manager was nowhere to be found, so I was escorted to the security office. Luckily, the security manager was able to contact the show director who gave me permission to enter the show early to set up. Once on the show room floor, I walked to over to the warehouse to retrieve my pallet. The first forklift operator who offers to help me looks for about twenty minutes and does not find my pallet. It is now 6:30 am, and by this time I am getting worried that maybe my pallet did not make it to the convention center from our office. Finally someone radios in that they found my pallet. I receive the pallet around 7:00 am and work like crazy to get everything set up in time. Thankfully the rest of the four-day trade show went smoothly and was a success. Start by sharing your idea with others and see what sort of feedback you get. Don’t worry about other people stealing your idea right away. People may copy you later down the road – once you have proven that your idea can be successful – but by that time it won’t matter, because you will have beaten everyone else to market. If people say they will actually buy your product or service after sharing your idea with them, then take the plunge and start that company! When I finally decided to take the plunge into starting my own venture, I realized that starting a company isn’t as difficult and scary as I thought. I’ve learned that becoming an entrepreneur is a learning process and it is impossible to know everything about starting and running a business until you take a chance and actually start a company. I have met so many other amazing and interesting entrepreneurs that would have never come into my life had I not started a company. It has been my experience that entrepreneurs want to help each other succeed and share their experiences. It’s through these connections that new opportunities are created, problems are solved, and valuable advice is freely shared. San Diego is a great hub for startups and entrepreneurs. There are a couple of really good groups that meet regularly to hold elevator pitch contests, networking events, and investor round table discussions. San Diego is a big city with a small town feel, where it is very easy to get connected to other startups and entrepreneurs in the area. Continue to spotlight entrepreneurs via interviews and interactive forums to highlight the amazing things people are working on out there. What skill or trait do you value now that you have created a startup? I think curiosity and asking questions have unlocked a lot of doors for me. Whether it is asking another entrepreneur how they got their product featured in the media or how they were able to get their product carried by a certain retailer, asking questions has been invaluable to me.